On the border between Zambia and Zimbabwe, about ten kilometres to the east of Livingstone, are situated the famous Victoria Falls. Here the mighty, two killometres wide, Zambesi River plunges two hundred feet down a sheer face of rock. This massive wall of water, broken on the rocks below, rises into a cloud of fine spray, as filmy and gentle as gossamer, and, as the Sunrises, it creates a magnificent rainbow. 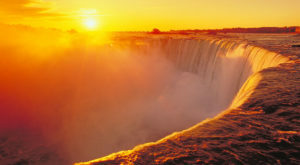 Locally these Falls bear the beautiful name “Mosi-oa-Tunya”, in English, “The Smoke that Thunders”. To visit the Mosi-oa-Tunya is a spiritual experience. Not only is the awesome beauty of the sight over-whelming; it induces a listening, meditative mood in the observer. When I first visited the Fallsin Easter 1976, I felt – like Moses before the burning bush – that I was standing on holy ground and that the only appropriate response was, not Wow!, but silence. “CHRIST rising again from the dead, dies now no more. Death shall no more have dominion over Him. CHRIST is risen from the dead, the first fruits of them that sleep; for by a man came death, and by a man the resurrection of the dead. As in Adam all die, so also in Christ all shall be made alive. It seemed to me, as I gazed in quiet wonder at the sight before me, that we human beings are like the millions of drops of water which are thrust into the abyss over the hard rocks. These rocks represent our life which is so often harsh and difficult. Like the drops of water, we are drawn into the abyss of suffering, whether we want to or not. But Christ went into the depths before us and rose from them unharmed. So will we rise out of the abyss of suffering, changed – as the drops of water are changed into the fine spray, the weightless cloud, borne by the Spirit – the wind – from the depths to the heights of heaven, and lit up by the morning sun. The Risen Christ – the Rainbow, now visible – radiates the Glory of the Father – the Morning Sun – and touches and lights up even the most insignificant drop, making it appear in all its precious loveliness. (Sr M. Illumina, O.P., Zambia, Easter 1976).